This is an open cluster located east of M24. Through binoculars you can see M23, M24, and M25 from east to west, M18, M17, and M16 in the north, and M8, M20, M21 and M22 in the south. This area is a treasure trove of open clusters and nebulae. It is large and contains many stars. Stars are fairly bright with similar brightness providing a fine sight. Many arch-shaped lines of stars look overlapping. 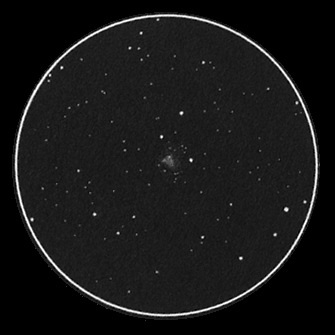 Near the center stars form a number of small conspicuous squares. There is a star at the edge of the northwestern side and a line of stars run toward it. These asterisms are conspicuous and pretty. 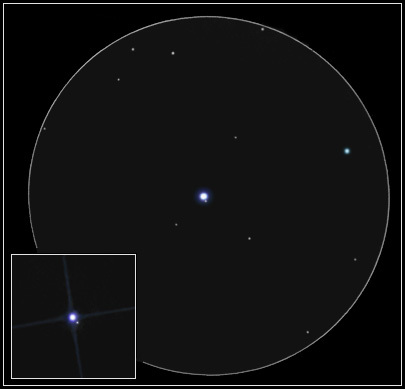 Sketch of a double star Rigel, in Orion. Star and the companion magnitudes: 0m ,8m. 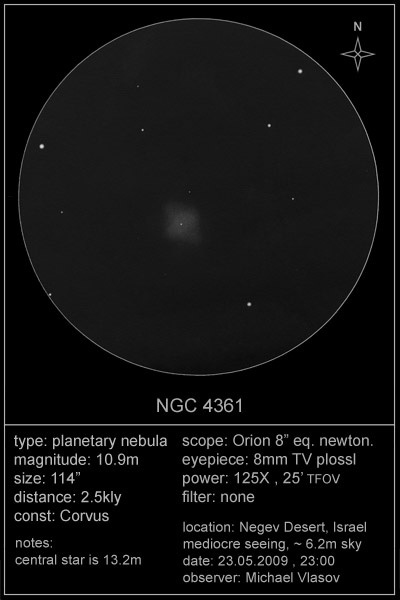 Instrument: 8″ Orion Newtonian, at 80X. Janis has beautifully captured the ancient, large, bright gravity held group of stars known as M 22. Only Omega Centauri and 47 Tucanae of the 140 or so globular clusters are brighter. This beauty of more than 100,000 suns scintillates above the lid of the teapot in Sagittarius. Specifically it is located at R.A. 18h 36m; Dec. -23° 54′. It is well placed if you are not too far north. At a distance of 10,400 light years away it is close to us and shines at about 5th magnitude. 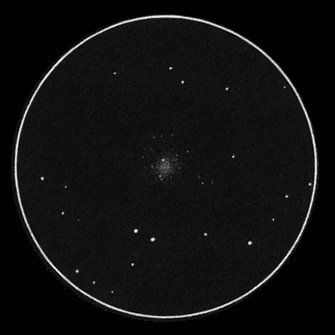 William Herschel may have been the first observer to recognize this patch of light as a cluster of faint stars. 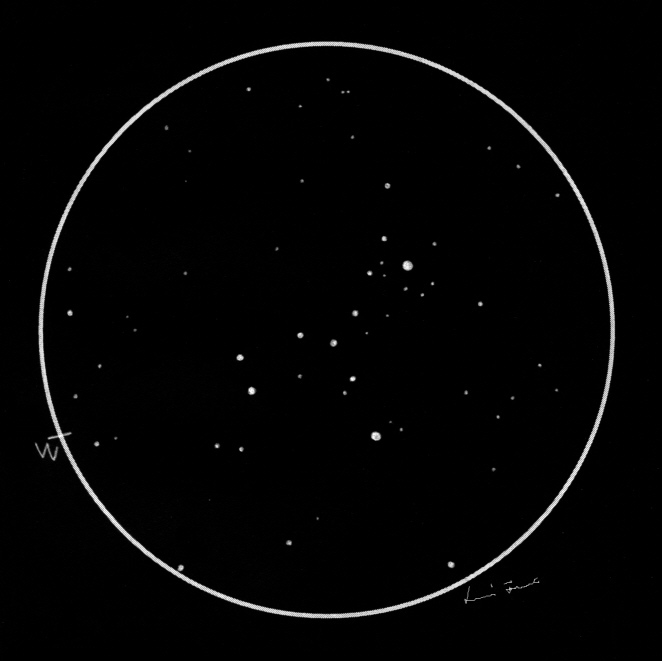 As you can see in this fine sketch many stars are visible here using a telescope of 8″ aperture. Hundreds of the stars are as bright as 11th magnitude in M 22. 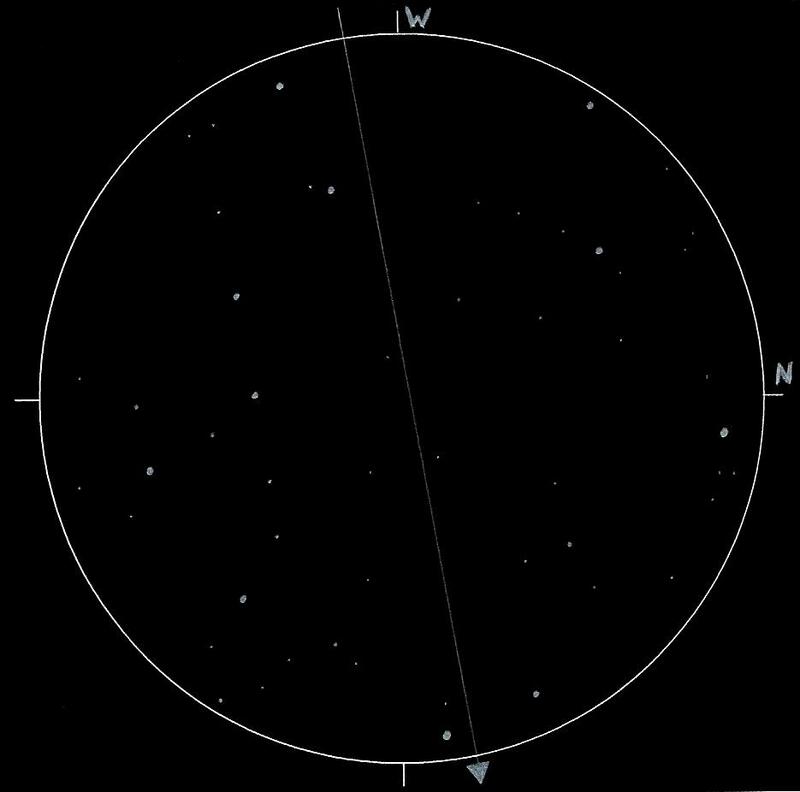 Currently this globular cluster is receding from us at 144 km. /sec as it orbits the center of the Milky Way. A Little Dumbbell or a Cork? Obiect name: Messier 76 (NGC 650). Eyepieces: Super Plossl 10 mm. Place: Poland, Zielona Góra (A few kilometers for city). Amateur astronomer: Przemysław Horoszkiewicz (Poland). This tiny little object is also known as the Rocking Horse cluster. The name says it all: it really looks like a little horse jumping around the space. Although it’s in a quite easy position, it still is a neglected object, as when it comes to Cygnus, everyone thinks of nebulae like the Veil and its companions, and the tiny shiny planetaries. Too bad, because this cluster is a real gem! 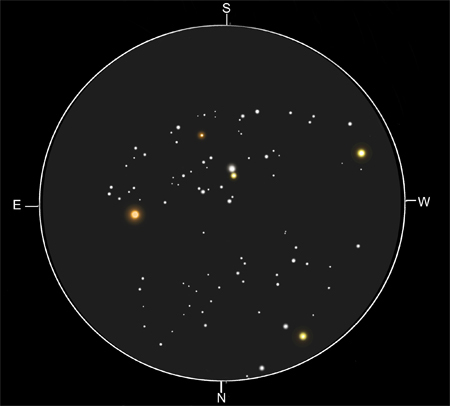 Its special features are the two brightest stars of the cluster (at the front leg and the eye), that are apparently yellow, even though their spectral class suggests a rather white colour. This optical illusion is caused by the interstellar dust that is so common through Cygnus. 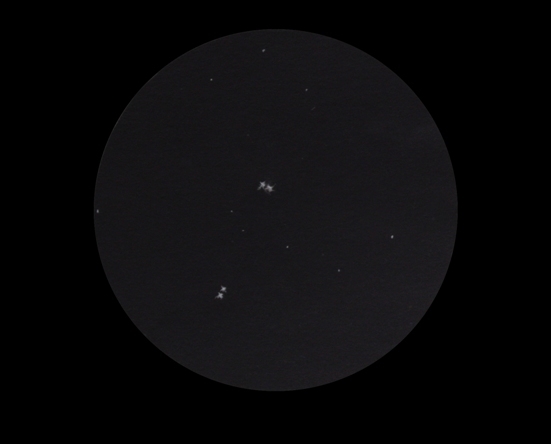 A very important hint: you should use a fairly high magnification when looking at this object, because it’s located in a field that is rich in bright stars, which makes it harder to detect the real shape of the cluster. 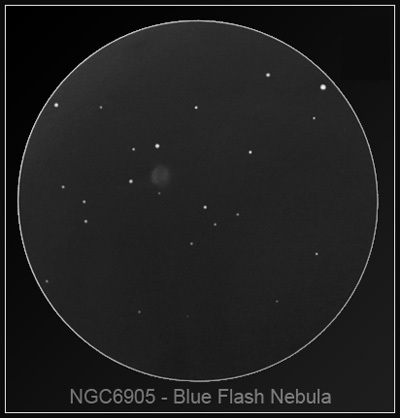 NGC 6905 is a tiny 12m planetary nebula in Delphinus, named a “Blue Flash Nebula” (probably due to it’s blueish color) and it lies 4700 light years from us. The nebula resembles a little stellar coffee grain, hidden between the stars. It can be quite a challenge to find, unless moderate aperture and dark skies are avaliable. However, especially at high powers, the look is quite rewarding. Observation and sketch details: The observation took place in Negev desert (Israel), at a local starparty. Sky conditions were excellent (~6.5m stars could be observed). 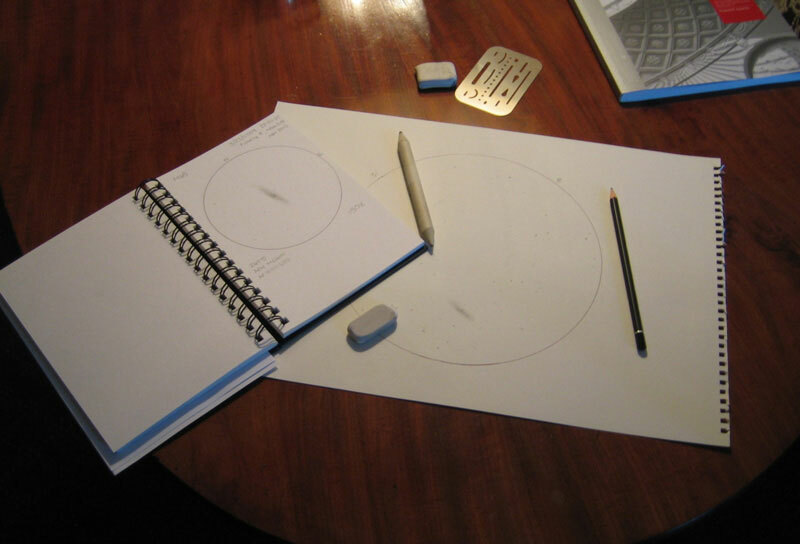 The sketch was made using 8″ Orion equatorial Newtonian, at 250x power, Graphite pencil and a red light. Then the sketch was scanned and inverted in Photoshop. 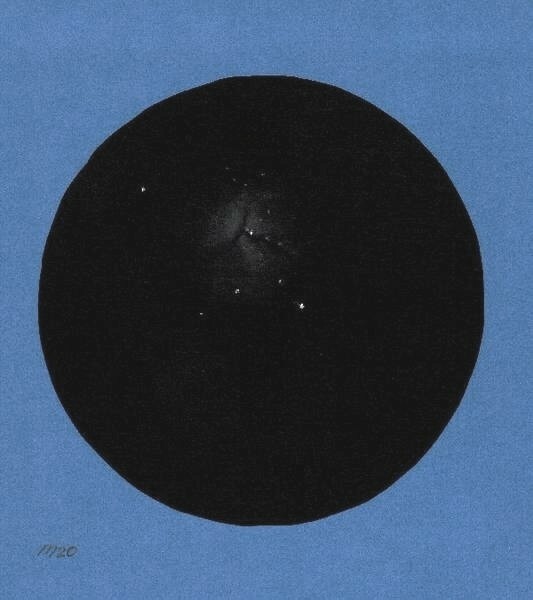 This is a fine eyepiece sketch of the Trifid nebula (Messier 20) in Sagittarius. Northern hemisphere observers at dark sky sites consider it a real summer time delight. 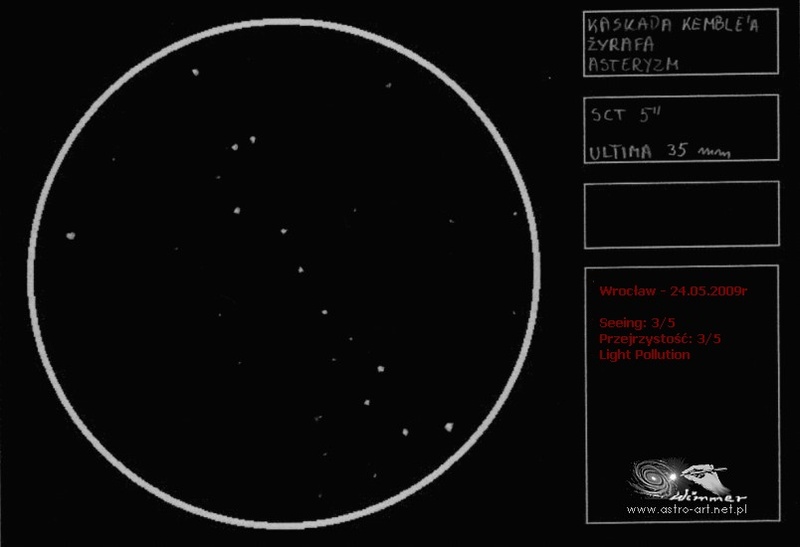 The glow sketched here is mostly an emission nebula but includes a reflection nebula component as well. Three lobes in the emission nebula portion were created by the light blocking debris remnants of exploded stars. The glow is mostly due to H II star formation regions of ionized gas and plasma heated by high energy radiation from hot young stars in the region. The distance to this deep sky object is not well known. It is believed to be between 2,300 and 9,000 light years away. Estimates of the visual magnitude of this treasure fall between 6.8 and 9.0, making it visible with binocular or a small telescope. 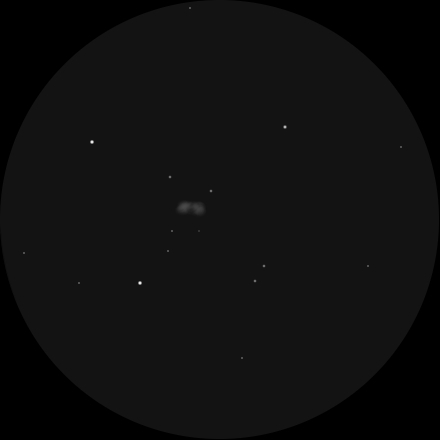 Charles Messier viewed and catalogued M 20 on June 5, 1764.
sysetm on our sky. It lookes gorgeous in large extention. 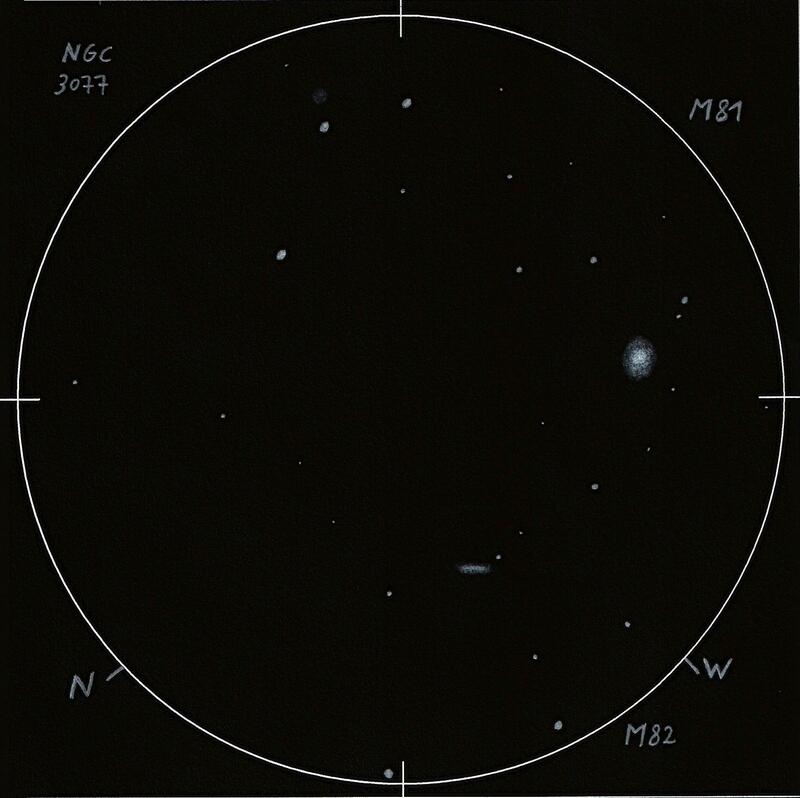 NGC 6535 is a tiny, faint globular cluster with four clearly separated stars on its Western side. However, I’m not sure whether they really do belong to the cluster, or they are just plain foreground stars. 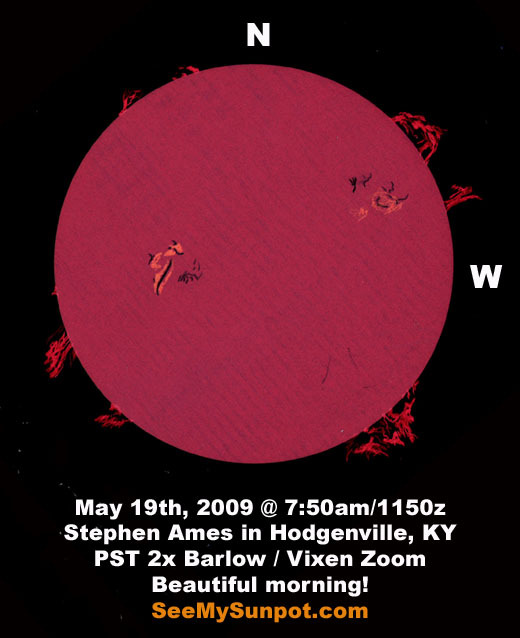 With several other stars resolved at its slightly brighter core, two of them can be seen clearly with this technique; while some others pop up here and there when the atmosphere calms down for some moments. The core, just like the globular itself is not really sphere-like, but rather looks a little bit like an onion, with the thinner part looking to the East. On November 18 2008 Endeavor astronaut Heide Stefanyshyn-Piper lost her grip on a tool bag during a spacewalk outside the International Space Station. The tool bag cost $100,000 and its loss meant astronauts had to share the remaining tool bag for subsequent spacewalks. The bag weighs about 14 kg and measures only 50 x 40 x 20 cm. It contained two grease guns, a scraper tool, a large trash bag and a small debris bag. On websites like www.heavens-above.com and www.calsky.com you can find the visible passes for your location. The maximum brightness of the tool bag is 4,8 mag. So in theory it can be a naked eye object. But in practice it turned out to be more difficult. I first tried to spot the tool bag with binoculars (7×50). After six failures I asked help on Cloudy Nights. Armed with the good advice from a kind Neal and a little refractor I was more lucky on the first of July. The tool bag passed almost overhead at a distance of 280 km (in his 3534th turn around the Earth). I was especially surprised by the speed of the satellite and there is no second chance. So Im not sure that the sketched path is 100% correct (it differs a little bit from the calculated one). It was far more difficult to recall where the tool bag entered than where it left the FOV. 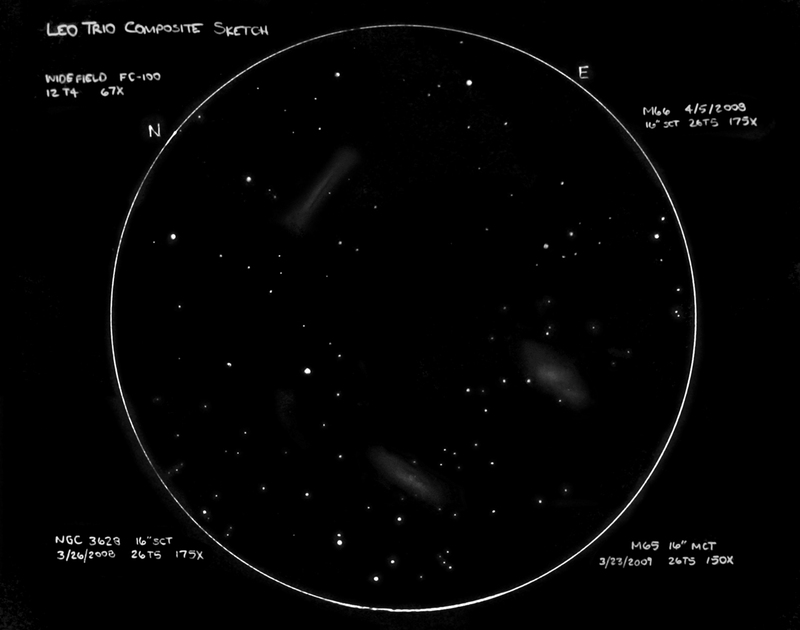 It was also the first (and maybe the last) time I used a lath for an astro-sketch. The calculated brightness of the bag was 5,4 magnitudes. The bright star on the right border of the sketch (north) is Kappa Cygni. The two bright stars below (east) are Iota 1 and 2 Cygni. 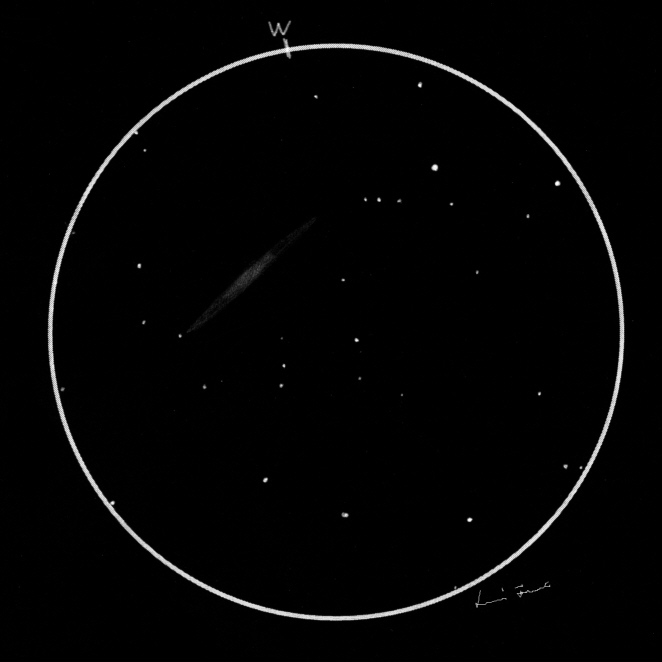 When I was sketching some background stars there was at 0.57 UT an unexpected visitor. A bright (mag. 2,3) satellite passed the same FOV than the tool bag. Some research on CalSky revealed it was a cylindrical rocket-piece (IGS 3A H2A) that measured 13,5 by 2,5 meters. A nice extra! When you live in a bright sky zone and can’t get away to a dark site, it may yet be worth your while to track down brighter galaxies if the transparency is good. This is what happened to me on Friday evening when I spent about 6 hours enjoying a warm dry summer night under the stars. 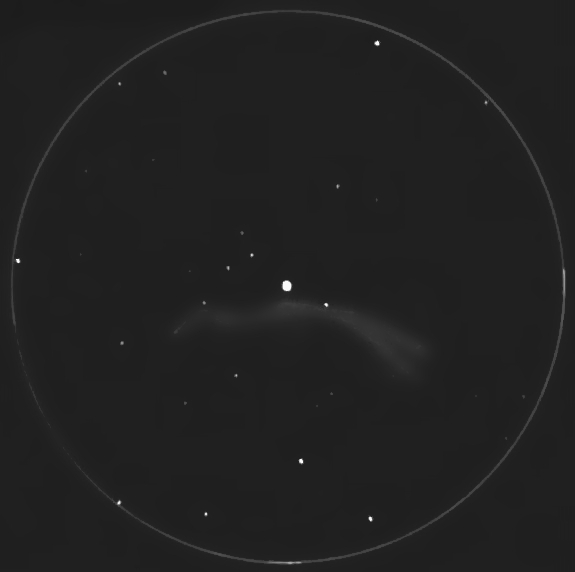 After a couple of hours of viewing bright galaxies, I remembered attempting to sketch NGC 5907 in late spring when clouds rolled in at put an end to observing. 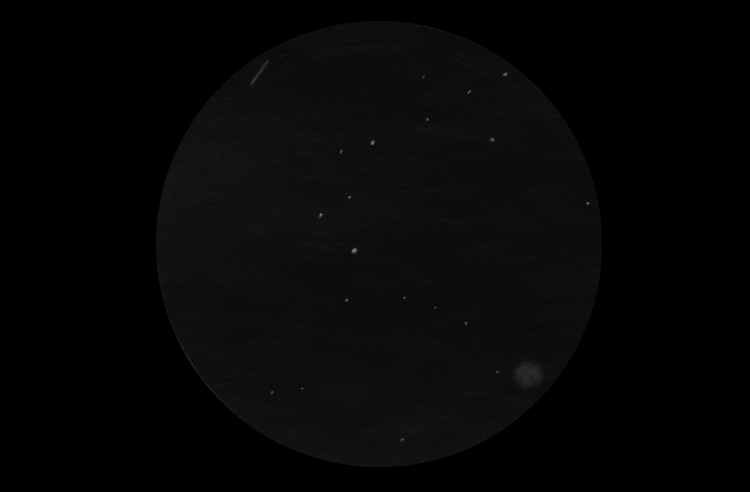 I returned to that edge–on galaxy on this evening and after getting as dark adapted as possible and moving the scope back and forth to stimulate averted vision, this is what I sketched. I did detect some irregular condensations of brightness in this galaxy. This galaxy is about 39 million light years from us and although nearly edge on does not seem to have much of a central bulge. 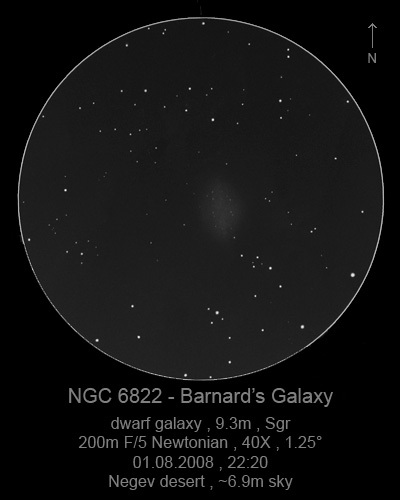 At low power it is a couple of fields of view to the east of the brighter lenticular galaxy NGC 5866 which is also nearly edge-on. 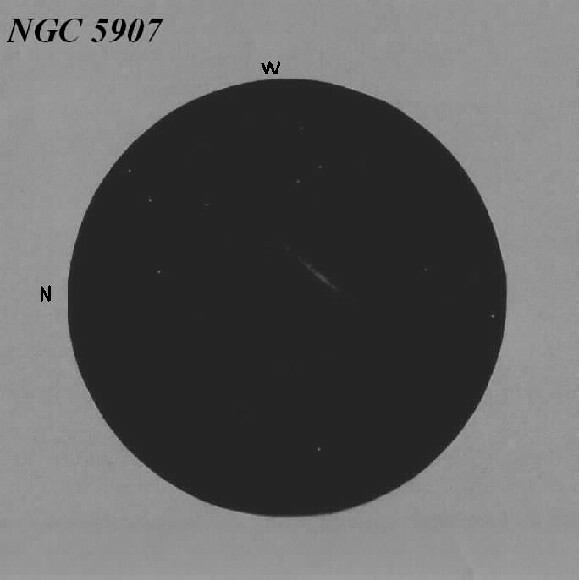 NGC 5907 glows at magnitude 10.3 and is located at R.A. 15h 16′, Dec. +56° 20′. I need about 10 inches of aperture to just detect this galaxy against the sky background on a good night. In 1788 William Herschel located and described this nebula [galaxy]. A sketch of NGC 4361 planetary nebula in Corvus (interesting planetary nebula, with double elongated structure). The view through the binocular was splendid, Antares highlighted with an intense orange and was surrounded by a diffuse cloud, visible with averted vision. The field was rich, plenty of stars, I distinguished perfectly the cluster M4 as a round nebula of grey cotton. Rho Ophiuchi showed flirt in the upper zone with its three components forming the shape of Mickey Mouse… with a blue intense color. The nebula around Antares appeared to reach Rho Ophiuchi indirectly. Sky brightness : 20.70 magnitudes per square arc second near zenith (SQM reading). Sketch made with graphyte pencil, difumino, on white paper. I scanned it and change to negative view. I added the color tone of the main stars. This globular is northwest of Albireo. It is a mid-size globular and fairly bright. It is grainy but even at 190x it is not resolved clearly. The center is triangular-shaped with even brightness. The outlying area is faint and diffuse. There are some faint stars further out, but it is not certain whether they are members of this globular. There is a double star north of the center. The faint outlying area is extensive in the north but almost no extension is detected in the south. However, there is a string of stars forming an arch in the south. 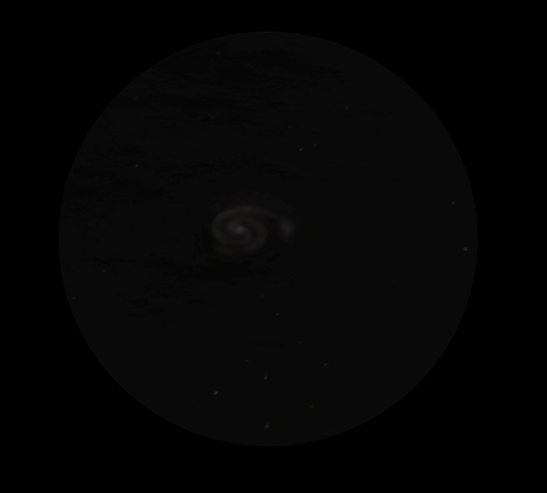 This is a large edge-on spiral with intermediate brightness, highly elongated in the NNE-SSW directions near the famous double, Cor Caroli in Canes Venatici. It does not show much detail like arms or dense spots, however its NNE side looks a little bit brighter and wider, which makes the entire galaxy look a bit asymmetrical. I estimate its average brightness at 12 magnitudes maximum, with an apparent size of 13′ x 2′. sketch on 18.04.2009 in Pyrnik, Poland. 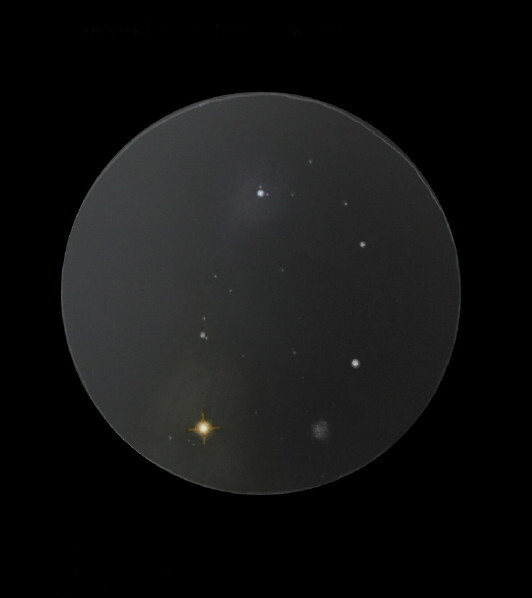 On december 27th 2008 I observed the Hyades with my 12×60 Celestron binoculars, mounted on the SkyWindow. The field of view (FOV) that these binoculars provide is about 5 degrees (300′) and the Hyades are just a little to wide, to fit into FOV. But although I didn’t see the whole cluster in one FOV, the first impression of this cluster was simply stunning. The brilliant deep orange Aldebaran, which actually isn’t a member of the Hyades but a foreground star, dominates the field of view, together with three bright yellow companions. These are three of the four yellow giants of the Hyades: Delta, Gamma, and Theta-1. 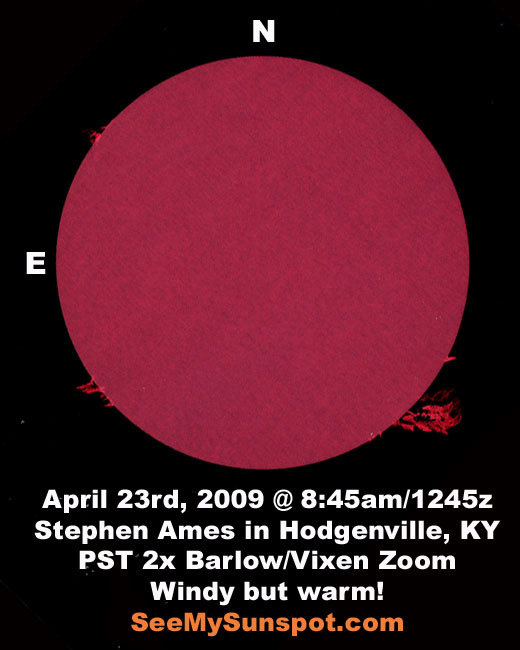 The fourth is Epsilon (which again didn’t fit in the same FOV). There were many different chains of stars and small asterisms (triangles and other shapes) visible. The northern and southern half’s of the cluster seemed to be more or less divided by a dark empty zone, with almost no stars. Beside Aldebaran and the three yellow stars, there were two other stars that drew my attention. First of all the brilliant white Theta-2 Tauri, with magnitude 3.3 the brightest star, the Lucida of the Hyades. It makes a beautiful double with the Theta-1, one of the yellow giants. To the south of this nice couple I detected the other prominent star, the reddish M-type variable V1146 (or 84 Tauri). In total I counted about between 75 and 85 stars, but I’m sure with my 300mm Dobson I could double or triple that number easily. 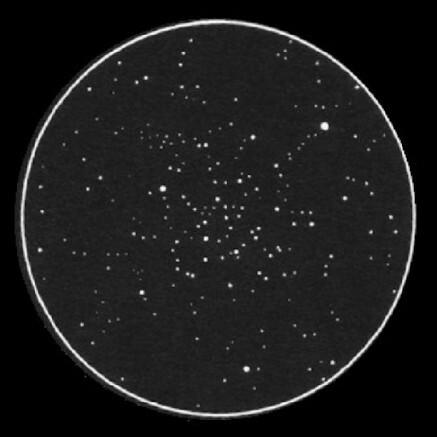 According to Archinal and Hynes (Star Clusters, Willmann and Bell) the Hyades contain about 380 stars. This makes it a rich cluster. I could not detect any nebulosity of unresolved stars or of any other kind. and an OIII filter. The sketch was made on the spot with graphite pencil on white Canson paper. Some minor improvements were made later in the daylight (shading, shape of stars). PS: this version with software processing is a little bit more realistic (but less authentic). Messier 11 or the wild duck open cluster as it is frequently called is a dense open cluster in the constellation of Scutum. A portion of this cluster is reminiscent of a flock of ducks flying in classic “V” formation. There are nearly 3,000 suns in this cluster, including many giants of all classes. The cluster is estimated to be 250 million years old and like most galactic cluster lies in the plane of the Milky Way. 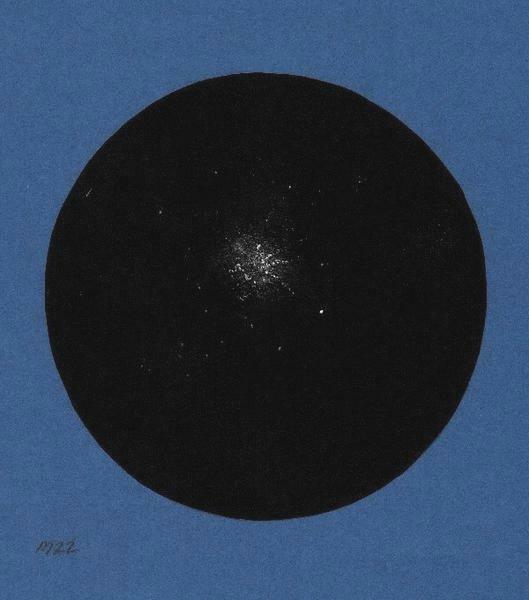 This cluster was discovered by Gottfried Kirch in 1681 and it was added to Charles Messier’s famous catalog in 1764. Apparent Size: 13 arc min. “Spindle Galaxy”. It appears to have mostly old stars and little or no activity. stopped because the interstellar matter was used up. The object is easily found. This is my sketch of the Kemble’s Cascade, the astrism in Camelopardalis. This object looks better in scope with wide angle of view. Unfortunately in my SCT some stars are out of the field of view. Place: Poland, Wroclaw – near city center. Weather: Not good. Seeing 3/5. Light Pollution. Technique: Graphite pencil. Scanned & inverted only. 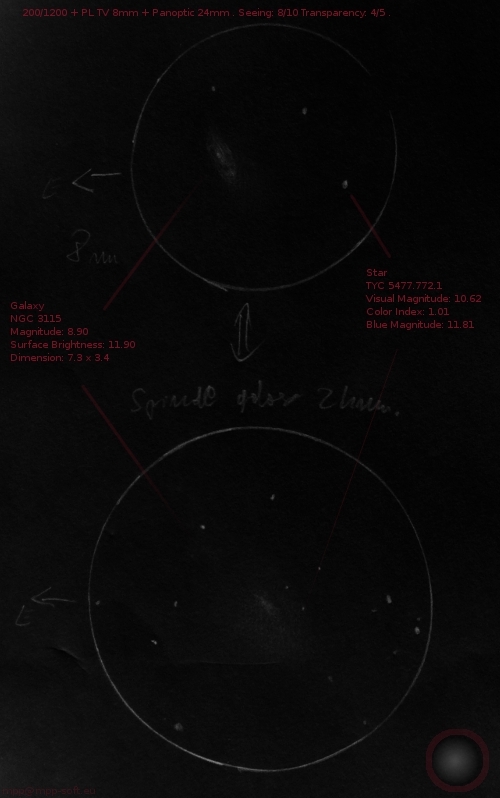 Sketch and Details by Stephen Ames Jr.
At a distance of 25 million light years away, M-106 is a bright spiral galaxy with about the same tilt angle as the Andromeda galaxy. This galaxy measures about 30,000 light years across and glows at a magnitude of 8.4. Like M-77 in Cetus this galaxy is a type II Seyfert galaxy. Pierre Méchain found it in July of 1781. Nearby there is a 12th magnitude edge-on spiral galaxy (NGC 4217) among a group of bright foreground stars. 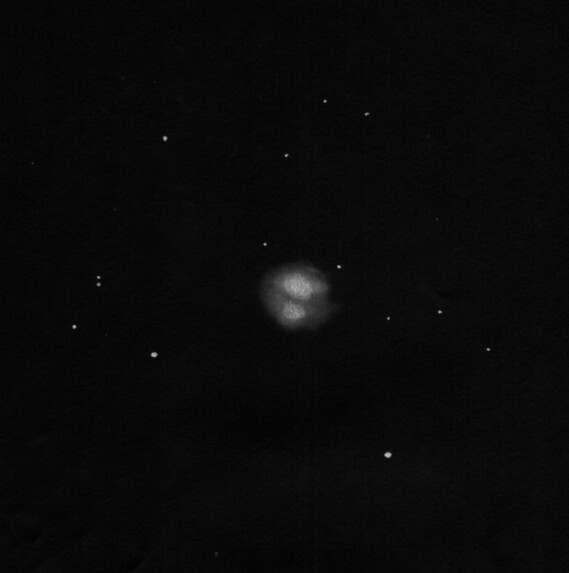 In years past using a 10″ scope, I was able to spot this galaxy before the urban sprawl erased it from my sky. Sky catalogue 2000.0 incorrectly lists this planetary nebula as an emission nebula. It is located in eastern Centaurus and glows visually at about 11th magnitude. Like M-76 in the northern sky this southern sky planetary is also a bipolar planetary. The central star was very massive and is now extremely hot. A central dark rift divides this planetary as can be seen in the sketch. An interesting description of this planetary can be found here. This object was discovered by John Herschel April 1, 1834. 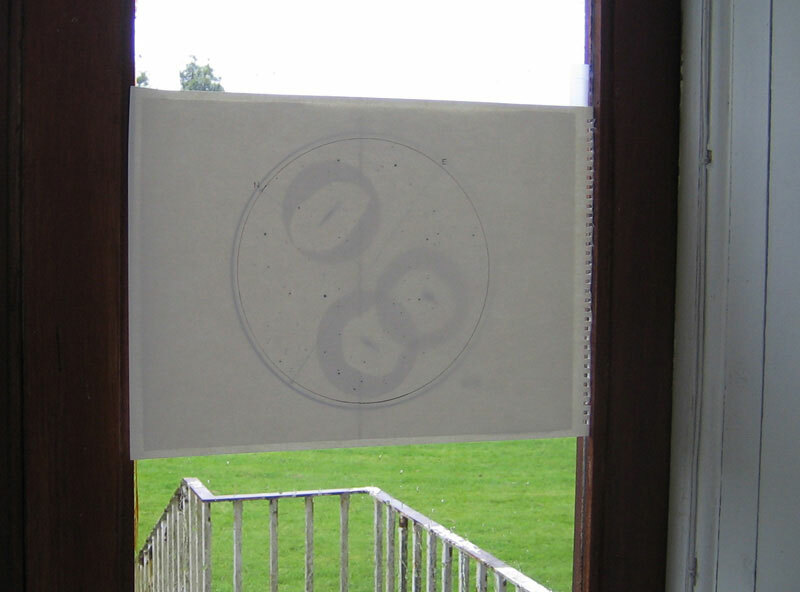 Drawings made using a home-built 47cm f/4 Dobsonian reflector. Is ole sol finally waking back up? This is a globular cluster southeast of Mel.111 in Coma Berenices. It is fairly large and even at 110x it is finely resolved. This is a beautiful globular cluster with individual stars appearing as pinpoints. The core shows even brightness and stars are well resolved to the center. North of the center there is a double, but they do not seem to belong to the cluster. The outlying regions in the northern half show scattered faint stars. The southern nebulosity does not show this. These are the planetary nebula M97 and the galaxy M108. Together are beautifully visible. darker place near the center. and I must say that gave me a lot of satisfaction. This beautiful view of M13, the Great Globular Cluster in the constellation Hercules, was rendered by Polish amateur astronomer Robert Gudański. The cluster, some 25,000 light years from Earth, contains hundreds of thousands of stars. It’s been said that the core of M13 is so dense with stars that a planet near the center (assuming a transparent atmosphere), would behold a sky full of bright suns. In fact the sky would perpetually be several times brighter than the full Moon. Not quite the place to be if you like Deep Sky Objects! This is a galaxy southeast of the Coma Berenices Cluster. 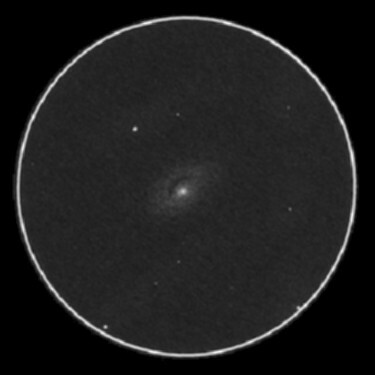 I sketched this galaxy soon after I acquired the 32cm Dobsonian, but I tried it again. It is bright and large. There is a small core-like condensation at the center with a sharp stellar nucleus. The surface brightness very gradually and smoothly falls toward the outer regions, which resembles the smoothness of cream. The outline of the galaxy is difficult to determine, as it fades into the background brightness. A dark lane runs east-north around the nucleus. It is quite clear and with a longer look, it will look like an image in photographs. The dark lane is bent in the middle. 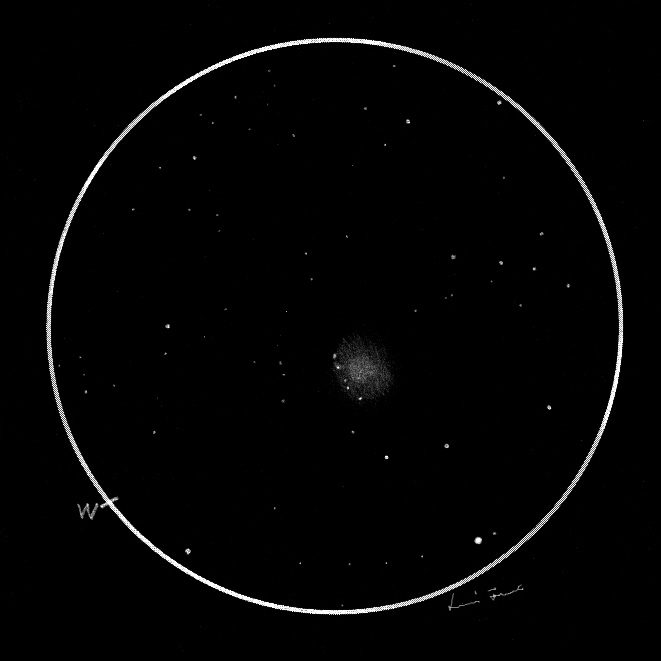 Now I want to present my last night sketch – Needle- galaxy NGC 4565 .This object lays in the constellation Coma Berenices about 50 million light-years away .. It is always a pleasure for me to watch the magnificent shape of this spiral beauty. It is one of the marvellous galaxies of spring night sky. The core of this object is sharp and visible, quite the contrary – long spiral arms are much more elusive.